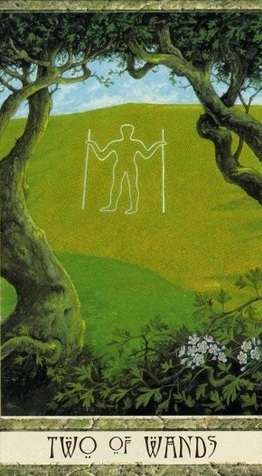 Today's draw brings back some themes from the previous reading, coming at them from a bit of a different perspective. Here again we have one of those less than joyful cups cards, the five. 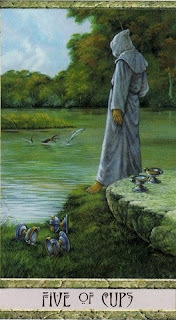 Usually this card shows a figure brooding over the broken or spilled vessels, ignoring the whole ones. Here we have something a bit different. The cloaked figure seems to be ignoring both. Instead he looks out at the water, fishes skipping through it, the way the sun and the color of the trees reflects on its surface. Perhaps he is taking a moment to think beyond the cups, beyond the immediate, positive or negative. He could be brooding, sure, looking at the water and not really seeing any of it, too absorbed in his own thoughts, problems. But maybe he is, in fact, appreciating the beauty that nature provides us, the little details that can bring us such joy and can be so easily forgotten, overlooked. Perhaps he is using this time to meditate on the large picture, to think abstractly. The energy of the fish in the water, the warmth of that sun, the slow passing of clouds in the sky - what can that inspire within us? There is always possibility, somewhere around us. Even if it is still vague, a chalky sketch on a plain far ahead of us, a hill we will have to climb up and conquer. There is possibility and opportunity, and so much of that may not be what we planned or expected - it too, like the reflected color of tree leaves on water, can be overlooked so easily, if we insist on remaining absorbed in what was, what could have been. There are so many things in life that we may have wanted, dreamrf of, planned for that, it turns out, were not to be. Will we spend more time dwelling on that, letting it cloak so much else, or will we focus on the new, on the future, on that vague outline that can slowly grow, become real to us?